It also adds an API allowing you guys to easily install/code Addons for this. You own a Server which is not only minigame-based and your Players got bored of playing Survival? Then you will absolutely love this Plugin! It adds a whole new Layer of Survival to your Server by adding more than 400+ new Items! IMPORTANT: I (mrCookieSlime/TheBusyBiscuit) have stopped working on this Plugin and now develop Video Games instead (more on my Youtube Channel). 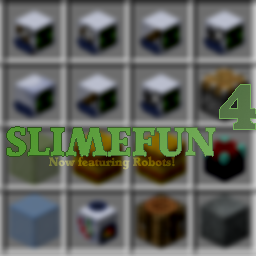 But this doesn't mean Slimefun is dead. This Plugin is available on GitHub, so if you are or know a talented Plugin Developer, consider contributing to it by making a Pull Request to keep this Project alive. • /sf debug_fish - (DEV) Gives you a Debug Tool which you can use to monitor certain Block's Performance, view their Data and erase it. You need to be OP in order to use this command. Check out Slimefun's Source Code, if you want to keep this Project alive, maybe even consider contributing to it by making a Pull Request!